Dr. Schultink is the UNICEF Representative to Kenya, Dr. Eggers is the WHO Representative to Kenya, Mr. Chatterjee is the UN Resident Coordinator to Kenya. NAIROBI, Kenya, Mar 27 2018 (IPS) - The Government of Kenya has prioritized universal health coverage (UHC) in its Big 4 agenda over the next 5 years. This is a significant and perhaps the most important strategic priority. Why? Every year over a million Kenyans get trapped into poverty because of a catastrophic out of pocket payments due to health reasons. In 1978, health campaigners worldwide achieved a major breakthrough at the UN Alma-Ata Conference on Primary Health Care. This conference statement signaled a new approach to health care, often described as the ‘primary health care approach’ or the ‘Alma-Ata principles’ – deeply rooted in the social and structural determinants of health (such as poverty eradication), and emphasising the importance of health care being accountable and accessible to the people it serves. A global target of achieving “Health for All” by the year 2000 was established. How do we ensure that Universal Health Coverage is possible in Kenya by 2022? The answer is simple. The focus has to be on preventable and primary health care as emphasized in the Alma-Ata principles. The centrality of reproductive, maternal, neonatal, child and adolescent health will be critical to achieving UHC. Kenya has made considerable but slow progress in reducing maternal, newborn and child mortality, but missing its 2015 Millennium Development Goal targets implies there is still a lot of pending work to give women and children the most basic of rights – the right to life and well being. As the First Lady of Kenya Ms Margaret Kenyatta has often said, “No woman should die giving life” which led to the launch of her signature Beyond Zero campaign and the Government declared a free maternal health care policy in 2013. There are two reasons for seeing maternal and child health as a forerunner for UHC. First, it is clear that the mother’s overall state of health has a lifetime impact on an individual child’s health. Second, there is now evidence that households with maternal health complications spend considerably more of their savings to cover medical expenses. This is particularly key in rural settings where women play major economic roles. The loss of women’s contributions combined with the spending shock they face can force households, particularly those already vulnerable, into deeply-entrenched poverty. Reduction of out-of-pocket expenditure is central to achievement of UHC. One approach towards this reduction must be promotive and prevention-based intervention. We already have several proven, low cost-high impact interventions for significantly reducing the number of women dying during childbirth and shrinking new-born and childhood mortality. About 74,000 Kenyan children under the age of five died in 2016, including 33,000 aged below the age of one month. At the same time, about Kenyan 6,000 women die every year from giving life, many from treatable infections. Many of these deaths could have been averted with relatively simple interventions. Kenya has done very well in developing relevant national guidelines and policies creating a framework that can efficiently deliver these high-impact maternal, newborn and child health interventions. Devolution of health services must now include cascading the policies to local health services, but more importantly, ensuring the guidelines are fully implemented. Another concern is the variations in mortality, with differences between rural and urban communities, rich and poor and between developed and under-developed counties. Even though Nairobi is the most developed county, it has the highest annual absolute number of maternal, newborn and child deaths compared to all other counties. This will only increase as the city population rapidly expands. Conversely, maternal and newborn mortality rates are highest in counties such as Marsabit, Turkana, Kitui, and Kilifi. The recently-released UNICEF report on the power of investing in the poor indicate that for every US$ 1,000 invested in health for the poorest children, nearly twice as many lives are saved compared to investing in areas where richer people live. The attainment of UHC must not be seen as a purely technical objective, but must be accompanied by purposeful redistribution of resources for equitable gains. The following low cost high-impact interventions will leapfrog UHC. These interventions should be included in the essential health service package that should be available to all Kenyans at no further cost: 1. 100% immunization coverage. 2. Scaling up maternal and child health by ensuring exclusive breastfeeding, hand-washing to prevent transfer of infectious diseases, chlorhexidine as an antiseptic for umbilical cord, newborn resuscitation, ‘Kangaroo’ mother care, family planning, antenatal and postnatal care and skilled delivery. 3. Prevention of water borne, vector borne, TB and HIV and sexually transmitted diseases. 4. Prevention of non-communicable diseases, particularly diabetes and hypertension. 5. Improving nutrition of women who conceive and follow this through to the first 5 years of a child’s life. Innovative approaches are needed to address weaknesses and shortages of human resources and focus more on improving performance of the existing workforce. Already, the government is emphasizing the role of community health volunteers in implementing some of these interventions. With over 70% of Kenya’s population under 30 years of age, the government of Kenya’s focus on UHC is critical for Kenya to reap a demographic dividend. It is crucial that we further strengthen our partnership between county governments, UN agencies, international development partners, civil society and private sector to seek the quickest pathways towards realization of universal health coverage. 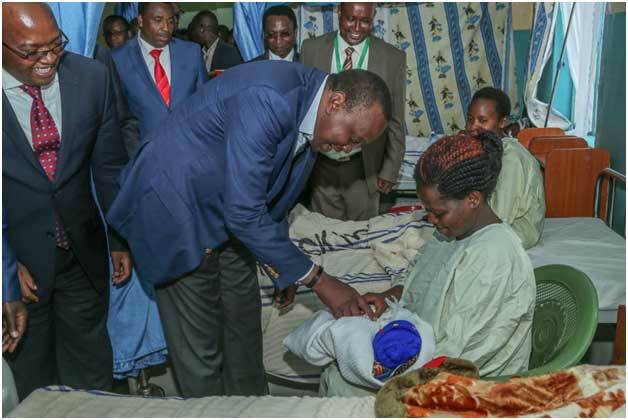 Kenya can lead the way in achieving universal health coverage.